Happy Tail: Easy the Coonhound finds the easy life. It was as if Easy were waiting for the Murchies to find him. 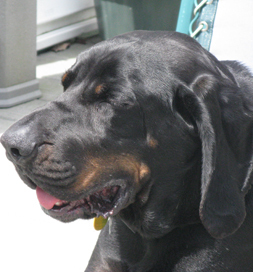 The black-and-tan purebred Black-and-Tan Coonhound had been a hunting dog until his person apparently gave up the sport, and the dog “fell into the hands of a neglectful and abusive owner,” says Gates Murchie of Vestal, NY. Easy had been wounded and deprived of medical attention, as well as deprived of food and water. Read Easy’s story in Gates Murchie’s words. Fortunately, Easy was rescued by animal control and turned over to the Humane Society of Schuyler Country in Alpine, NY. “Despite their limited resources, they spent six months and several thousand dollars in medical care to get Easy ready for adoption,” Murchie says. He got a new home, but he didn’t get along with the family’s other dog, so it looked as if he would end up back at the shelter. Instead, his “mom” and Georgie Taylor at the shelter launched a campaign to get the big guy adopted. At about the same time, the Murchies had made a decision. Their beloved dog, Elektra, had died four years earlier and they had finally come to grips with the fact that they were in “sore need” of another dog, says Gates, and his wife began searching on Petfinder. Originally, she limited the search to Border Collie mixes to replace Elektra, but then she realized they couldn’t really replace her. She expanded the search to all dogs within a 100-mile radius. The list was huge. “There, on the last of many pages, she found Easy and his story,” Gates says. But their panic was needless. They were a perfect match and the adoption came to pass four years, to the day, from when they had lost Elektra. Easy is, as his name suggests, a mellow dog and reminds Gates “of Andy Griffith in a really good dog suit.” Easy is also a word that aptly describes the life the pooch now enjoys with a family who loves him. His “dad” blogs about him regularly.